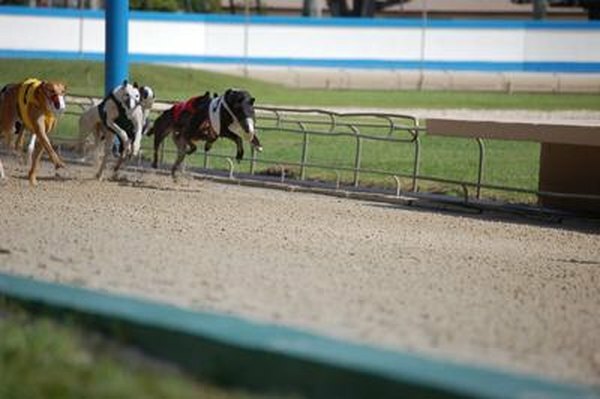 Racing greyhounds are frequently injured on the track. Greyhounds are normally laid back couch potatoes, but if you have adopted a retired racing greyhound, affectionately called a "greyt" by greyhound fans, you may notice some anxiety. This is not unusual and it's easy to treat with a little patience and caring. As the Eagles so succinctly put it, "life in the fast lane, surely make you lose your mind" and this is certainly the case with retired racing greyhounds. Racing greyhounds are kept crated for most of the day, live in cramped quarters with other dogs, are forced to run in temperature extremes and transported in inadequate vehicles. A greyhound who has been a racer for a number of years may have some trouble adjusting to his new life. Some whining, panting and pacing in the first few days of coming home is normal. A newly retired racing greyhound coming into a home and family for the first time has a lot to deal with. He has never seen a staircase, a pool, grassy lawns, small household pets and kids and may not even know what carpeting and tile are. Keep in mind that new experiences can make any dog anxious and everything is a new experience to a greyt. Like a breeding dog in a puppy mill, a greyhound has been kept in a too-small cage all his life, and though it may be cruel and inhumane, it's what he knows and affords him some small comfort. Providing a crate for your greyhound will help quiet his anxiety if he feels the need for security. Don't shut the door to the crate and allow him to come and go as he pleases until he understands he will not be imprisoned. The retired racing greyhound has not been through a basic obedience class. Getting her into a group training class will go a long way towards helping her to be less anxious. She will be around other dogs, which she is used to, and she will be interacting with you in a positive way. One word of advice, however: don't be alarmed if your greyhound won't sit. Greyhounds on the track are often poked if they sit down so they don't appear lazy to people laying bets. Because of this, don't press the issue if your greyt doesn't sit. Forcing her to do so will only increase her anxiety. You may find your greyt is suffering from separation anxiety. Many dogs who were not exposed to human contact when they were puppies are at risk for separation anxiety later in life. Greyhound puppies are not lovingly raised by a human so this applies to them. Dogs who are with people too much, or too little, can also be afflicted with separation anxiety. Remember, your greyhound has been around other dogs and people every minute of every day of his life so far. If you leave your greyhound alone and find he is whining or barking at the door, defecating or urinating on the floor or exhibiting destructive behaviors, you may need to seek out professional help to deal with his separation anxiety.